For several months leading up to the election, I was stunned, along with several of my family members and friends, to hear what was coming out of our would-be president’s mouth. His speech about women, alone, had me thinking there was no way my 13-year-old daughter would be looking up to this man as the leader of our country: his hateful words, predatory ideals, and alarming rhetoric waved off by some as him being “a man who speaks his mind” didn’t sit well with me . . . at all. I didn’t want to rush to judgment. I would never vote for him, but I wanted to understand why some people trusted him with the important matters of our country and people. I found out quickly, and with a bit of trial and error, that an honest conversation about the topic could and probably would plunge into the never-ending rabbit hole of political, religious, and moral abyss—never to be solved and likely to end in anger. There were a few times it had gone badly. Lesson learned. I then did what many of us do when we don’t want to alienate those we love: I stopped talking about the election. It was a no-go zone for conversations at family get-togethers and dinners out with friends. Except for addressing my daughter’s questions and concerns, gently fishing for a friend’s opinion in a subtle side conversation, or occasionally debating with people who I knew could discuss a different opinion without getting angry, I mostly kept my beliefs to myself. So I waited. . . . I waited to form an opinion of Trump because some people in my life whom I respect—and who truly want the best for their country and family—strongly believe Trump is the change our nation needs. Maybe his behavior was a campaign tactic, they rationalized. Maybe he would somehow become a different person after he took the oath of office. His acceptance speech after the election gave me hope that a new “presidential” kind of man, one who might be worthy of leading our country, would emerge from the mudslinging of his antagonistic campaign. I was still stopping myself from rushing to conclusions, being cautious not to overreact. So I still waited. And I watched. I watched as he continued to recklessly tweet about other countries and threaten their deep-seated values. I watched as he praised media outlets that cast him in a favorable light and condemned others who threatened to expose a different opinion, calling it “fake news.” I watched as he proposed a tax plan that could harm, not help, marginalized groups such as Solo Moms. And, more recently, I watched as he eradicated civil rights, healthcare, and climate change from our nation’s agenda last week within hours of taking office. And now I can tell you, I’ve watched enough. This “president for the people” didn’t waste any time scraping away the issues our country has debated for years, issues we discuss and consider carefully because WE CARE about them. Even though there are differences in opinion, we debate them because they are worth the time it takes to sort them out. And now they are simply brushed aside within moments of having a new administration? I wanted to give our new president the benefit of the doubt and see where he was going to lead us. 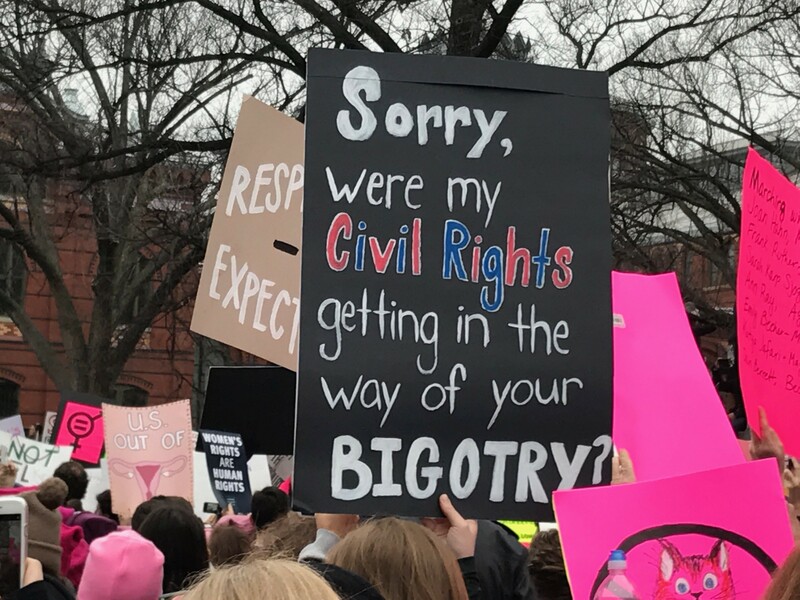 But in recent days, as he forcefully changed the direction of our country within hours of taking office and made it clear where we are headed—from a nation that cares about togetherness and “we the people” to one that seeks to profit at the expense of tossing aside issues so many Americans hold dear—I asked myself and others around me: Why aren’t we more concerned? I went to bed the night of President Trump’s inauguration feeling like I was living in an alternate reality. I also felt that when I woke the next morning, the country as I knew it would be completely different. Then I saw it. . . .
Women began flowing into our nation’s capital. The trickles became waves, and the waves erupted into masses of women marching—peacefully—in opposition to President Trump. Images were flooding in from Sydney, Berlin, London, Paris, Canada, and South Africa of more than a million friendly-faced women, men, and children marching across America and all over the world. It was the answer to my question: We ARE concerned. And we’re not the only ones. Thank you so much, from the bottom of my heart, to everyone who went out in droves last weekend for the Women’s March, which meant so much more than feminism and women’s rights. It was all that and more . . . the peacefulness and size of this protest made me feel safer and less afraid—and Solo Moms could use a lot more of this in the months and years to come. You’ve done more than given us hope; you’ve given us a voice. I now know exactly what we need to do moving forward: we need to stop being afraid to talk about the tough issues and open the dialogue between us, no matter our differences in opinion, and continue to have our voices heard so we can stand up for ourselves, our children, and our futures. I pledge to keep talking about the things that matter to me and stop being silent, even if a conversation gets uncomfortable. There’s too much at stake not to. Check out ESME’s closed Facebook Group called ESME Collective Action, where we share ways to advocate on behalf of Solo Moms.